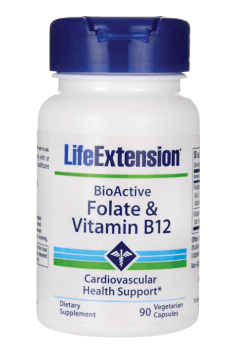 BioActive Folate & Vitamin B12 by the company Life Extension are active and the most bioavailable for the organism forms of the most important vitamins from the group B. The product is distinguished by the high content of (6S) 5-Methyltetrahydrofolic acid folate (400 mcg) and methylated form of vitamin B12 (methylcobalamin) at the dose of 300 mcg. Folate – also called folic acid, vitamin B9 or B11, is the best assimilable form for our organism. It is especially recommended to pregnant women, as it influences the proper development of the nervous system of the fetus and prevents many birth defects of heart or urinary system. Moreover, vitamin B9 takes part in the blood-forming process and cell divisions. Folic acid, in the form of methyltetrahydrofolic acid is totally safe and ensures the most available form for the organism, therefore it may be used without any worries by people with the genetic mutation of MTHFR gene, which disturbs the production of MTHFR enzyme, essential for folic acid metabolism. Vitamin B12 – in large amounts appears only in animal products, therefore especially vegetarians are prone to large deficits. It takes part in cell divisions, erythrocyte production and fatty acid breakdown. It supports the production of melatonin, which is responsible for productive and steady sleep. It influences the proper work of the brain and nervous system, improves memory and concentration, therefore it is especially recommended to elderly people. Apart from vegetarians, the group especially prone to vitamin B12 deficits are people suffering from reflux and consequently people taking medicines neutralizing gastric content. Gastric acid is necessary to produce and absorb vitamin B12, therefore such people are especially recommended supplementation with this active ingredient. Active forms of vitamins B9 and B12 contribute to regulating homocysteine level, i.e. the most important marker of complications in the cardiovascular system. Moreover, increased level of this amino acid in blood is related to the risk of stroke, Alzheimer’s disease and higher bone fragility. Bioactive forms of vitamins from the group B are an effective method to fight hyperhomocysteinemia. Summing up, BioActive Folate & Vitamin B12 by the company LifeExtension constitutes the best forms of vitamins B on the market. Thanks to high doses, they perfectly supplement the deficits of these important ingredients, which is reflected in the general improvement of health and well-being. Bioavailable forms of these vitamins contained in our product become more assimilable and safe for everyone who want to fully take care about health. BioActive Folate & Vitamin B12 90 caps. A standard dose is 1 capsule a day with a meal. A dietary supplement especially recommended to women planning to have children and pregnant women. The proper form of folic acid is essential for the proper development of the fetus. Methyltetrahydrofolic acid and methylcobalamin are safe and ready-made forms of vitamins B, which work well for people who have gene MTHFR mutation.